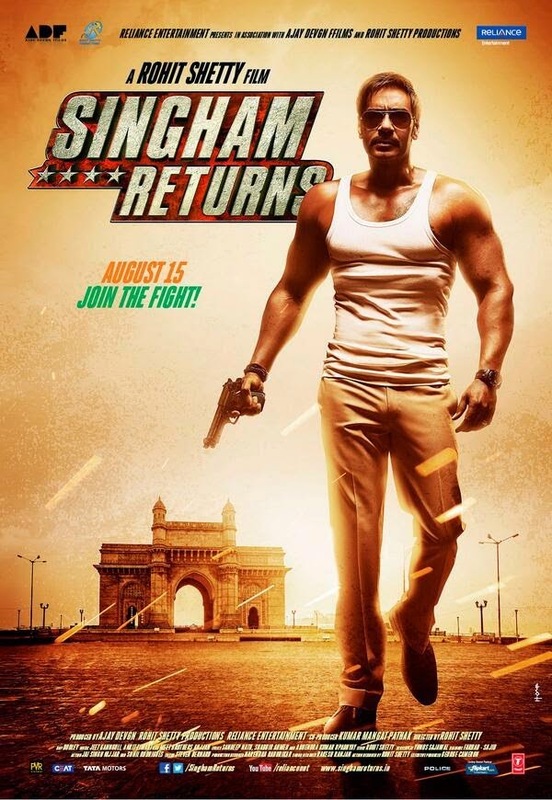 On India's 68th Independence day, Singham Returns. I have not seen the first edition, Singham, but had heard how entertaining it was. So there I was, 9:30 am, in a houseful screen of the multiplex, ready to sit back and take in this franchise, with all its machismo, fights, bullets and of course Jeeps blowing up. Rohit Shetty I must say has perfected the art of combining muscle, mass appeal and mayhem. The film opens with an old constable being dismissed from duty, a gang of young bikers have taken his cap for a second time and he could not do a thing. He tells his senior, I have Diabetes and Blood Pressure, and if I was younger I could have caught them. Enter Singham. Who shows the kids taking police for a ride is not going to happen as long as he is around. D.C.P Baji Rao Singham (Ajay Devgn) is now posted in Mumbai. He is an honest cop, and his team respects him and follows his footsteps. He is taking care of an elderly and idealistic politician Guru jee's (Anupam Kher) security. When the opposing, corrupt politician (Zakir Hussain) and a double faced godman (Amole Gupte) can not influence Guru jee's decision to include new and patriotic blood into the party, they get him killed. Singham fails to protect him, as Guru jee dies saving him from the bullets. On the other hand an honest police officer is found dead inside an ambulance carrying crores in black money. As the plots entwine and Singham declares an open war against the criminal elements of politics, the film is all about his revenge, and avenging the name of his junior. The film is an out and out masala fare. Dialogue baazi ranging from the good old "Ataa Mhazi Satakli" to "Tum chahe do baar B.A kar lo par BaBa nahi ban paooge" keep the audience entertained. The crowd cheered loudly and clapped when Singham says "Daya Darwaza Todo" to his colleague Daya (C.I.D fame). The crowd is given a series of seeti bajao sequences and Rohit Shetty keeps the going ons crisp and fast paced. In the second half though, the pace slackens for a bit, the film gets preachy and sermonizes, but gains back momentum in the last 25 minutes. Ajay Devgn is believable in his act, and in a scene he is bathing on the ghats and you see his ripped body, adding to the credibility of some cool fight sequences. Kareena does a decent job given the scope of her character, adding some fun moments to the film. Anupam Kher has a brief role, but is well cast. Mahesh Manjrekar is good to watch after a long gap. Amole Gupte has done a fabulous job as the sinister Godman and gets some of the best lines of the film. The supporting cast including Ashwini Kalsekar playing a Barkha Dutt inspired media reporter do a good job. The film has a rousing climax, lacking in logic but replete with emotion and plays totally to the gallery. The budget is lavish, as is obvious from some neat helicopter shots, stunts and the overall scale. The film works because the common man wants to see justice prevailing, they want a win, when in reality they battle for survival, and Ajay Devgn who has carved a niche for himself. The Shetty-Devgn jodi works this time too. If you want to relive the days of the Angry Young Man, taste a bit of Masala and adrenalin, go for Singham Returns.